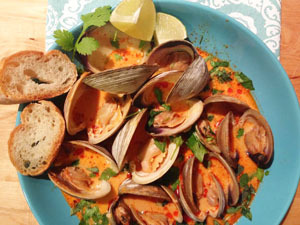 Wow, look at this photo of an amazing, colorful, creamy, packed with flavor sauce with some sea salty delicious little neck clams, all tucked in there ever so lovely, with the crusty bread just waiting to be soaked in this sauce and to be enjoyed for a wonderful meal!Yum! MMMM, mmmm, mmm! For those of you who have been reading my blog and visiting my website and other social media, you all know how much I love seafood…all of it! I can eat it everyday. From fresh whole fish, sweet succulent lobster, juicy crab, mussels, squid, shrimp and to the ever so popular clams. When I prepare clams, I usually do the very popular, clams with garlic, olive oil white wine and pasta-but tonight I wanted to change things up a bit and bring it up a notch. Now, even though this recipe has red curry, it’s not that spicy,it’s just packed with flavor. I enjoy all cuisines of the world. Ever since I can remember, I have been introduced to so many different varieties of food that it has really opened up my palate to the world of different flavors. My belief is that we live in a rather large world with so many interesting cuisines and foods that are indigenous to those areas, and if we can experience them, we should. Open you world beyond burgers and pizza. The flavors are amazing, the textures are interesting and the satisfaction from sharing these foods is priceless. This recipe is inspired from Thailand. The red curry, coconut milk and lemongrass are many of the ingredients used in their culinary world. They are full of flavor yet they do not overpower each other, they compliment each other. The red curry adds a bit of a slight kick, but not too much. The coconut milk adds that silkiness and the lemongrass adds such a unique citrus taste like from nowhere else. I hope you will try this recipe and expand your palate to some wonderful flavors of the world. I assure you, you will be making this recipe over and over again, but as always, Enjoy! For this recipe please visit my website at http://www.yvettesgourmetkitchen.com Please write back your comments, as I love to hear from you!